Orbis completes its portfolio with new and quality Category 6 and 6A cable line. It is called Orbis Vaski. 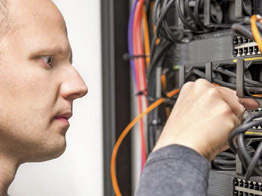 We at Orbis know our customers and network installations. The know-how of in-building cabling enables us to build up a product line which is up to the challenge. Orbis Vaski ensures easy installation and reliable end result. It is important to us to provide also personal and flexible service. We want to know our products so well that we can help our customers to choose the most suitable product for their needs. It is important to finish building sites in shedule so reliability in deliveries and easy ordering process are also considered. A quality cable is easy to install and clearly labelled. Patch cables for Keystone standard have variations between 0,5 to 30 metres. With this V-tool Keystone connectors are assembled 70% faster. Compatible mechanics for Keystone sized connectors: racs, panels and other mechanics. The quality of a connector is equal to ease of installation and reliablity of the connections. Orbis Vaski connectors are Keystone standard sized and they can be assembled with V-tool or 110-tool.